Agave nectar is a sweetener commercially produced from several species of agave, including Agave tequilana and Agave salmiana. 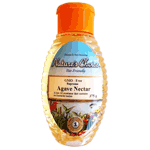 Agave nectar is sweeter than honey and tends to be thinner and flow more freely than it. A low GI sweetener that contains no harmful toxins. Bio-friendly. Import of South Africa.